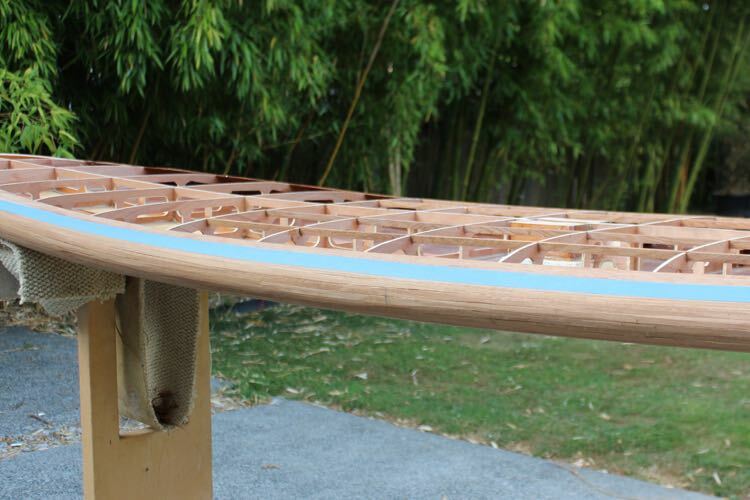 With the “stripping” complete it is now time to “feather” the top of the rails so that you can attach the top skin. 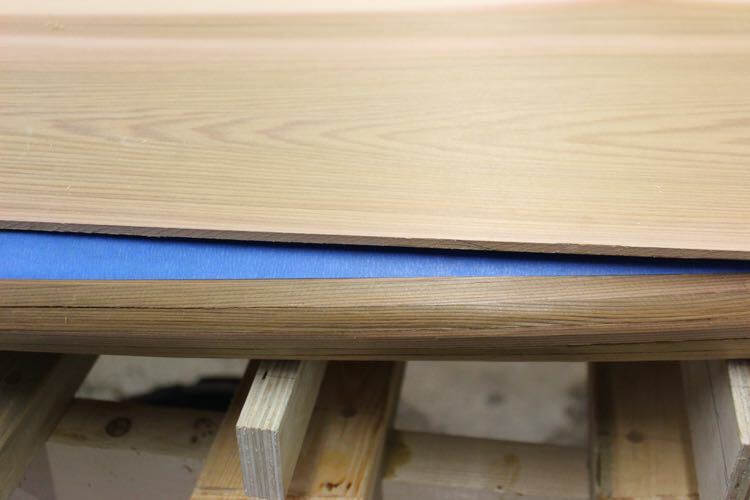 The goal in this step is to create a flat symmetrical gluing surface that allows the top to evenly transition to the rails. Start this step by sharpening your tools as sharp tools allow for a crisp transition with defined edge. 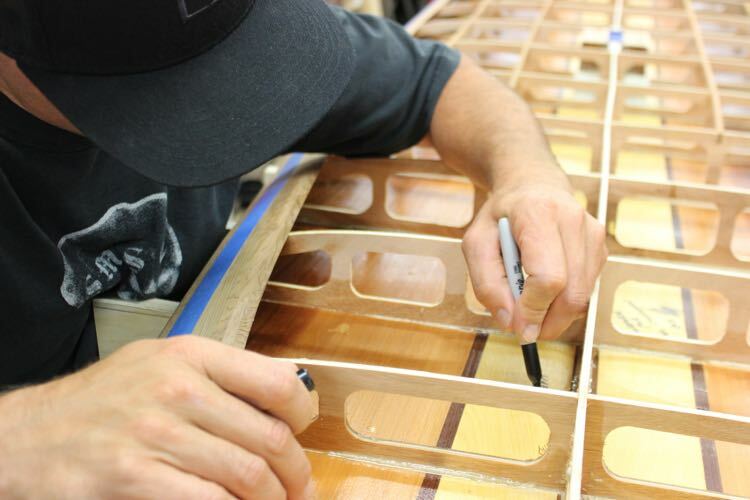 The flat gluing area changes in width depending on the steepness of the rail curve as well as how many rail strips were added. The most important thing is the edge of the flat area you create should be perfectly symmetrical from side to side and a fair curve front to back. This pink line represents the goal in this step. Rail strips feathering from nothing to full thickness with a flat surface for the top skin to rest on. 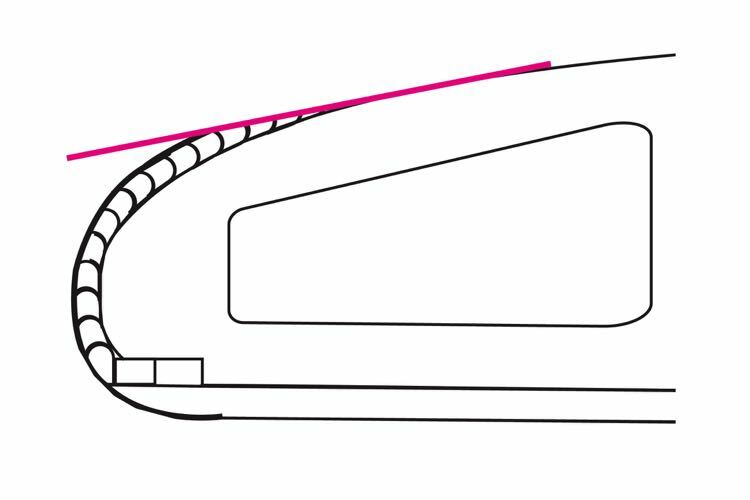 The rails shaped perfectly above the apex of the rails before cutting the flat (pink) landing area for the top deck. If you try to shape this area after the deck is attached you will get a wavy transition for deck-to-rail. Here is a properly feathered rail. 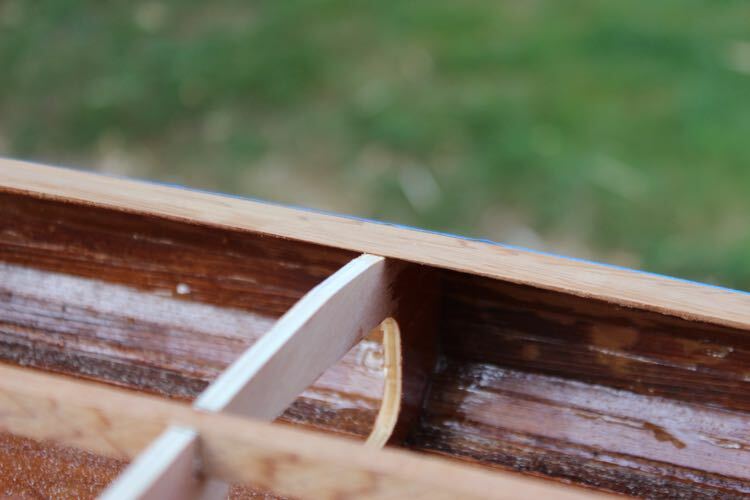 You have to be careful not to catch your tools as they pass the ribs, as the feathered edge gets really thin. Angling the cutting edge and going slow helps prevent the tool from catching. Use a stick the thickness of the top to check how far the top should flex. It is important that this area is a fair curve when viewed from above. Depending on the ribs profile the flat area will change in width but it should do so evenly and smoothly. Painter’s tape put right along the flat-to-rail allows you to check that the transition has a fair & symmetrical curve. The goal is to have a defined sharp transition and not a soft corner. This defined transition helps as a visual guide later when you are removing the excess material from the top panel. This picture taken near the tail of the board and you can see above the customers right hand how far the feathered area extends. In the centre of this Eleven 2 the transition is half this width. The second benefit of the painters tape is provides a visual reference after the top is installed. With the bottom of the rails already shaped you just simply remove the excess material from the top skin until whole the tape is visible. I will cover this in more detail in another tutorial but basically you do not want to reshape the area covered by the painters tape at all. Your goal is to remove all the excess material above the tape without even having to sand this transition area.